Location: I grew up in Chicago. I spend most of my time in San Francisco. I work with Costanoa Ventures in San Francisco. Years of VC experience: Eight wonderful years as a venture capital investor and the last three years as a personal angel as well. Position description: I’m a Principal who leads seed and Series A investments in technical teams with product / data instincts and the ambition to build platform businesses. I’m most passionate about software and security infrastructure, healthcare and financial services and apply a lens of machine intelligence to those markets as I invest. A particularly enjoyable part of my job is debating and validating technical hypotheses with talented (and sometimes insular) people in the field, and with them determining which approaches are digestible, capital efficient, and have the potential for outsized business impact. I’m spending a lot of time these days reading and being more hands on helping portfolio companies. Q. Who are a few of the individuals in the industry that have been the most critical to your professional journey? One of my former partners, Imran Akram, trained me as an Analyst. He taught me the value in communicating concisely (“less words on the slide Farooq”) and had an attention to operational detail that would sicken most people. I’m grateful to have adopted these abilities which added to a base of intellectual curiosity, passion, excitability and technical instinct. A few years into my career alongside him I invested in several enduring companies including Auto1 and Remitly at the early stage, which now both have line of sight to IPO. Another Brit and former partner, Mike Chalfen, has been a shining light for me in the past few years. He is one of the most human and holistic (in understanding the marriage of technology, finance and strategy) venture capitalists I have met. I’m honored to call him a friend and mentor. Finally, I must mention my amazing, entrepreneurial sister – who essentially raised me. Faiza always believed in me despite my many shortcomings. I’m grateful to have had such a strong female role model early in my life which has had positive impact on both my professional and personal relationships. She also helped me write my first angel check in Redlock.io which just had a great outcome! Q. When you were younger, what did you want to be when you grew up? The first thing that comes to my mind is wanting to be Michael Jordan (so I guess that means professional basketball player). I was obsessed. I even named my family pet gerbils Michael and Jordan. My parents wouldn’t let me shave my head though. I don’t look or sound like many of the successful venture capitalists I know of, back then and even now. I came from a non-traditional educational background and didn’t have much exposure to frontier technology nor relationships with professionals in the industry. It was hard to break in. When I did get my shot, I thought the way to ‘the top’ was to integrate and mimic the habits and styles of successful bay area-type venture capital partners. Talking to and wanting to associate with them was something I actively thought about. It was a fundamental insecurity. Later in my career, I realized that just being myself–and leading with my intellectual curiosity, empathy and analytical (sometimes contrarian) mindset–would provide the most value to founders and my team members. I guess the main advice I’d give my younger self is to not be afraid of what can make you different because it is a source of strength. Not being true to your differences is doing injustice to all of the experiences, people and settings that have had an impact on you. Authenticity has made me a more effective and successful investor / board member. What qualities do you appreciate in the people you’ve worked with? Empathy, Learning agility, grit and a really good sense of humor. I hope to enable greater access to the technology industry by funding as well as hiring individuals with cognitively diverse backgrounds. Having worked on three continents with many different kinds of people, I wholeheartedly believe in the strength of diversity. I co-founded diversity.vc to accelerate this change (the status quo is just unacceptable) and look forward to a more inclusive future. Please get in touch if you have a common personal view or want to partner or help out. 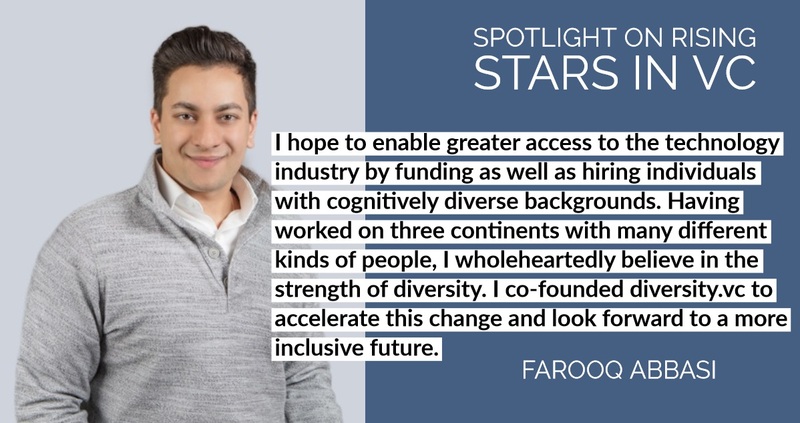 Keep up with Farooq via his Twitter, LinkedIn and Medium!